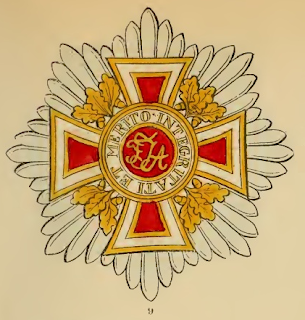 As the Order of St. Stephen was exclusively destined for the nobility, the Emperor Francis I founded, on the 7th January, 1808-the day after his marriage with his third wife, Louise of Modena-a new Order, named after the Emperor Leopold IV, and extended it to all meritorious subjects, civil or military, without regard to rank or birth. The first distribution of the Order took place on the 8th January, 1809. The Austrian Emperors are the sole Grand Masters, and have full power to confer the Order upon any one they please. The badge (Nos. 10 and 11) is an octagonal red enamelled cross of gold, and white encasement. On the obverse of the round red centre are, in monogram, the initials "F. I. A." (Franciscus Imperator Austriae), while in the white mounting are the words : "Integritate et Merito" (For integrity and merit). The reverse is white, surrounded by a golden oak wreath, and containing the motto of the Emperor Leopold IV : "Opes regum corda subditorum" (The riches of kings are the hearts of their subjects). Between each of the four arms of the cross are seen three oak leaves with two acorns, while the whole is surmounted by the imperial crown of Austria. This Order is also divided into three classes. 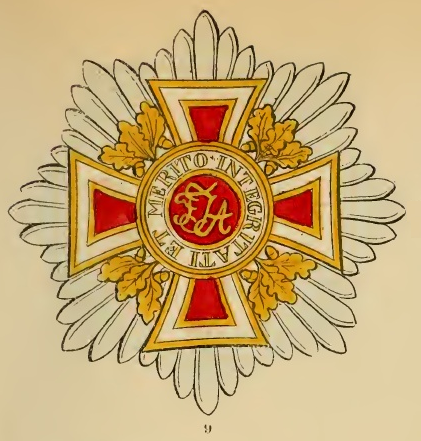 The Knights of the Grand Cross wear the decoration across the right shoulder, suspended by a red ribbon with white stripes at the borders, loosely hanging towards the left hip. Close to it, on the left side of the breast, is a silver octagonal star, the centre of which contains the obverse of the cross insignia. (No. 9.) On festival days, the cross is worn upon the breast, suspended by a golden neck chain, the links of which consist alternately of the monogram initials "F. L" (Francis and Leopold) with the Austrian crown above them, and of wreaths of oak leaves. The Commanders wear their cross round the neck, suspended by a smaller and rather narrower ribbon (about an inch wide), while the Knights (simple) wear the cross of a smaller size, at the button-hole of the left breast, by a narrow ribbon of about half an inch wide. The uniform or costume with the exception of the mantle, is for all classes red and white, (the national colours of Austria). The coat with an upright collar, breeches, shoes, and cap, are all of red velvet. The coat is lined white, and edged with golden embroidery four inches deep, representing garlands of oak leaves. The shoes are adorned with bows of gold lace instead of buckles. The body is girded with a white silk sash richly trimmed with golden fringes hanging over the sword, which is adorned with gilt bronze, the hilt forming a cross. At one side of the pommel are the initials "F. I. A." and at the other, the foundation year of the Order. The scabbard is covered with red velvet. The cap is adorned with white feathers, and with a golden cord, which is twisted round it three times. The neck-collar, four inches wide, is of cambric linen, it falls down the neck, and is trimmed with gold lace. The gloves, of white leather, have large gauntlets adorned with golden fringes. The white velvet mantle-the symbol or knightly purity and virtue-distinguishes the various classes by its length and width, as also by the depth of its golden embroidery, and by the trimming of white silk plush in imitation of ermine. Without special permission (which is, however, never refused), no foreign order can be worn at the side of that of Leopold. The festival is always held in the Court Chapel on the first Sunday after Twelfth-day. The rights and privileges of the members are the same as those of the Order of St. Stephen. No one can be honoured with the latter without previously possessing the corresponding degree of the Order of Leopold, so that every class of the latter must precede that of St. Stephen.